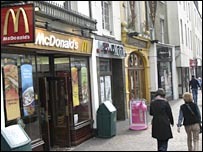 Fast-food chain McDonald's saw profits double in the last three months of 2006, after selling burrito firm Chipotle and boosting European sales. The company, the largest restaurant chain worldwide, saw profits reach $1.2bn (£610m) in the quarter ending 31 December, from $608.5m a year earlier. The strong results came as European sales reached their highest level in 15 years thanks to new products. Wider choice and longer hours have helped the firm, said analysts. In the US, like-for-like sales, which exclude new store openings, rose by 5.9% in the quarter. Laurie Hahn, an analyst with Deutsche Bank Securities, said the arrival of the chicken wrap on the menu and extended opening hours, had helped boost the firm's brand. "In short, we see the continued progress on strengthening brand equity," she said in a research note. The sale of the Mexican-style company Chipotle during the quarter helped increase the value of shares. McDonald's chief executive Jim Skinner said the firm's focus on serving customers a "balance of new menu items, premium products and everyday value in convenient, contemporary locations" helped results.